Since the times of St. Francis of Assisi in the 13th Century, Franciscans have always worked out in the community to do Gospel service in whatever capacity was needed. The Capuchins are a type of Franciscan friar known for the hood on their habit, called a cappuccio in Italian. During the plague epidemics that swept through Europe, for example, Capuchins and other groups did the best they could to help people. During the early 1900s, Fr. Solanus Casey worked as a porter, or doorkeeper, at St. Bonaventure Friary on Mt. Elliott Street. Many people came to him to share what they were going through. Fr. 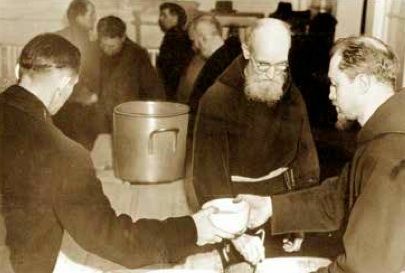 Solanus did his best to respond to people through listening and prayer, and would help with food when necessary. In the early 1900s, ethnic immigrants that had come to Detroit for jobs in the auto industry would come to see him. He opened the door for everyone: rich or poor, and people of different religions and ethnicities. This openness and listening spirit have been a guiding principle ever since. Our Capuchin Province (region) of St. Joseph itself was going through some change around the time the Capuchin Soup Kitchen was established. In 1911, it had accepted the mission parish of St. Ben’s in Milwaukee that served African American families migrating north. Br. Jerry Smith now works there at the St. Ben’s meal program. In 1926, the Province also accepted the St. Labre Cheyenne Mission in Montana which was meant to help people being displaced by homesteading. Internally at that time, the friars were adjusting from being mostly of German descent to now having friars of Italian, Irish (including Fr. Solanus) and other ethnicities. As the porter, Fr. Solanus tried to respect where each person was coming from and to offer his full attention and presence to whomever he was ministering. Hopefully, during the last 90 years we, and by “we” I mean guests, volunteers, donors, staff, friars and all of our partners in ministry, have been able to carry on some of that tradition. Read more about the Capuchin Soup Kitchen in our recent newsletter.